We asked, and Staten Island answered. 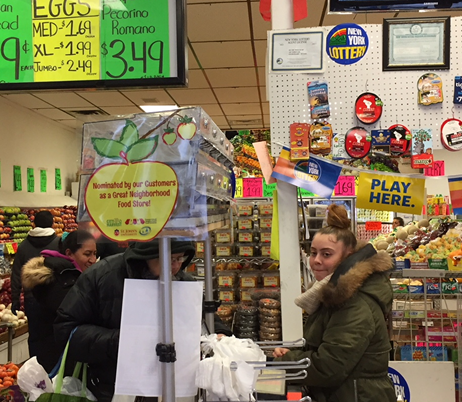 Staten Island Neighborhood Food Initiative and The Staten Island Partnership for Community Wellness (SIPCW) asked Staten Islanders for the names of stores or restaurants with fresh produce, local ownership, healthy and tasty food, ethnic diversity and authenticity, and owners and managers who love their neighborhoods. More than 90 stores were recognized by community members as a “Great Neighborhood Store” and seven were selected as winners. Tonight St. John’s University, Staten Island Campus, is holding the Difference Makers Certificate Ceremony to acknowledge Tottenville and Susan Wagner High School students who have worked on this important project and others for local non-profits. The event will be held in the gymnasium from 6 to 8:30 p.m. The seven winning stores will also be recognized. SINFI decal is on display at Great Neighborhood Store winner Big Time Produce, 1361 Forest Avenue. 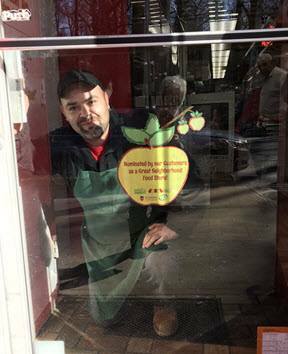 Great Neighborhood Store winner Pastosa Ravioli, 1076 Richmond Road, shows off its nomination decal. Big Time Produce, 1361 Forest Ave.
Everything Goes Book Café, 208 Bay St.
Jimmy Max, 280 Watchogue Rd. Leo’s Deli, 1153 Forest Ave.
Pastosa Ravioli, 1076 Richmond Rd. Seaside Turkish Restaurant, 124 Ocean Ave. The Staten Island Neighborhood Food Initiative is a coalition of City Harvest, Staten Island Partnership for Community Wellness, and other businesses, organizations, and individuals committed to making Staten Islanders healthier one neighborhood at a time by increasing access to and demand for healthy fruits and vegetables. 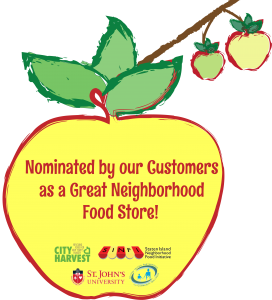 For more information about the Staten Island Neighborhood Food Initiative contact Susan Fowler at (917) 734-3746 or at sfowler@cityharvest.org.